These are some interesting new releases, all still, including one oak-aged cider. Still cider is a category I like a lot. We don't see enough of it. The concept of cider as just a sparkling beverage is too limiting. The still ones are often, in fact, my favorites. The wine analogy—near and dear to my particular heart—becomes ever closer at that point. When ciders are still, crisp, dry and seriously made, you really get that "fine wine" feel to them. More and more, they just begin to remind me of a high-personality white wine. There are certainly quite a few—Muscat, Gewürztraminer and Dafni, to name just three. With cider, of course, the key is merely the apple (or pear) flavor overlay. You get used to that pretty quickly. They are often less jarring than something like a Gewürztraminer. In some respects, the still ones, unadorned and naked, so to speak, best reveal the upside potential for the cider category. Let's put it this way—whether you think it's a good thing or a bad thing, if Chardonnay only came to you as Champagne, you'd have a very different view of it, wouldn't you? No, I am not advocating for the disappearance of many wonderful sparklers. Just try some still ones every now and then. Remember that when I use a vintage date, that is informal based on some note or lot number on the label. By law, these are technically considered non-vintage—even when they are not. Most will have some indication of when the apples were harvested somewhere, though, so you can match the release that I'm reviewing with what you are buying. This field blend is sourced from a biennial, single orchard, only about 1/4th of an acre, planted specifically for hard cider in 1995-2000. The cidery references a "mouth-watering finish." There is plenty of acidity here, to be sure, but the mouth pucker is no more than on the Packbasket, probably less, in perception at least. This is more balanced, the fruit nicely lifted, but not showing quite as much of that "sour green apple" nuance, although there is some. It is not as intensely fruity, either, but the "just-crushed" feel to it makes it gloriously fresh and invigorating just now. This is quite fine. If you want to see why you pay a bit more instead of buying the mass market stuff, this is a good example with purity, a serious feel and nice texture. It is a cider that drinks like a fine wine. There were 88 cases produced. Made from wild seedling apples "gathered by hand in the hedgerows and forests around Ithaca," this has an intensely fruity finish, but the fruit is all dry, tending to sour green apple. With a fair bit of mouth pucker—perhaps even a bit too much at the moment—it shows average concentration, but all that zing and zest on the finish. The fruit lingers beautifully, in a dry and serious fashion. This isn't a sweet 'n' easy style, so take note. You'll either have to really like acidity or use it strictly as a food pairing. It is my style, though, and I rather liked it. I suspect it might show better in a year, however. It is a cider that might need a little cellar time. It may yet have the chance to improve notably with time. It is certainly a big step up and a very different style of cider than the "Old Time" that I reviewed earlier this year (that being more straightforward and easy). There were 96 cases produced. This is the outlier of the group because it was aged in well-used French oak for nine months. This is principally a blend of wild and cultivated crab apples and bittersweets. That, in and of itself, is a story. Cidermaker Steve Selin told me that there are "wild bittersweets found in a hedgerow. Very bitter apples" and "one variety of crab that was planted as a rootstock trial, and an employee working on the project recognized it as a potential cider apple and transplanted the tree to his home and sold them to a couple cidermakers. Very tannic and medium acid..." Plus, he said, "Malus baccata AKA Manchurian crab. Very tannic and acidic. The fruit by itself was 14 grams per liter of acid." Then, "other foraged and cultivated fruit such as unidentified farm trees and northern spy. Most of the apples that give this cider its character have no names...."
Oddly, since there is oak here, it is the least expensive of the trio. Cidermaker Steve Selin said, "The Pomme Sur Lie is less expensive than the others not because of the process, but the fruit. Not that it is cheap fruit, which it isn’t, but the others have fruit that is extraordinarily scarce and/or labor-intensive to harvest. The Packbasket is all wild seedling apples, many of which have to be hauled out of the fields on our backs sometimes for up to 1/4 mile. And the Stone Fence Farm was from such a small orchard (1/4 acre) that the fruit is super scarce. Stone Fence will be sold out for a year probably before I can make it again, since the orchard is entirely biennial. The Pomme Sur lie has some wild apples in it," but also others. Just bottled on September 19, 2016, this is in the marketplace, so I was willing to taste it about a month or so later. It may well improve when it settles down, but it was pretty fine right now. With the best body of the three offerings this issue, this fills the mouth beautifully. The oak (four to six years old, mostly but not quite 100% neutral) gives it a hint of a sweet edge from wood on first sip, but that is quickly overwhelmed and/or absorbed by the cider's acidity, freshness and concentration. With air, it becomes more transparent and fresher as the acidity and power combine to eviscerate the wood. The wood, to be sure, does mute the purity of the fruit just a bit. If you want full-on fruit, try the Stone Fence or the Packbasket. Still, this was easily my favorite of the three, good to drink on its own or to pair with food. Its relative richness and concentration will help it match most foods for which you might select a white wine--its acidity will take care of the rest. It is pretty terrific. There were 97 cases produced. Overall, this is an intriguing trio from South Hill that is well worth seeking out. 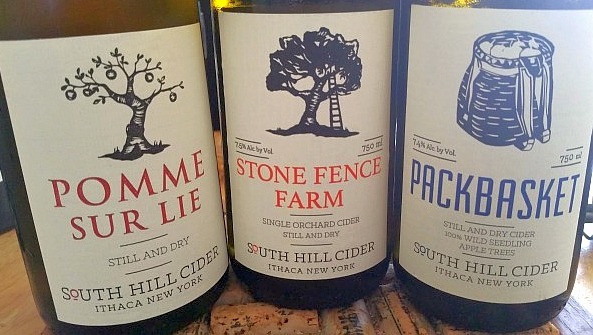 If you haven't experienced still ciders, this is a good time to start. Here is my thesis, the key reason for this article: Colheitas are too often underrated and undervalued (perhaps more so in the USA than in other places like, say, Portugal itself), whereas I believe that the great Colheitas are fully the equal of the great vintage Ports, whose reputation typically overshadows them. Colheitas deserve more attention. Sometimes it seems like they get almost none here. Our reviewers reflect on the past year.